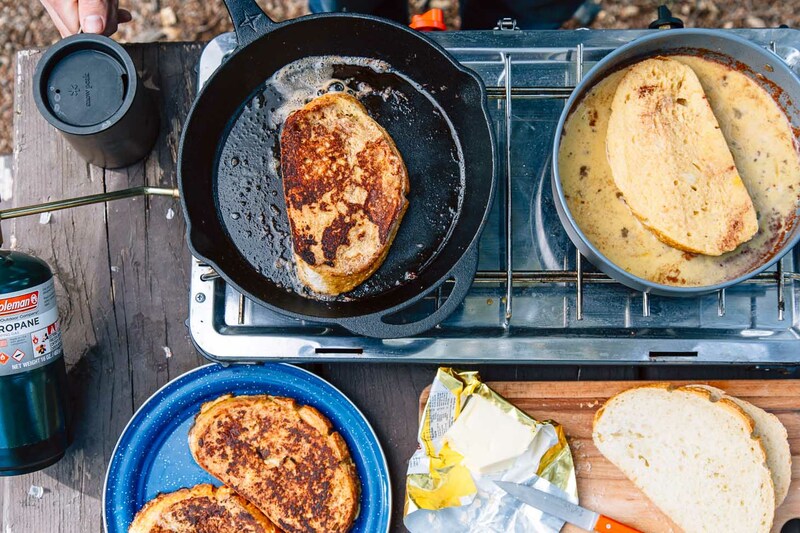 This is the one and only recipe you’ll need to make exceptional French toast on your next camping trip. 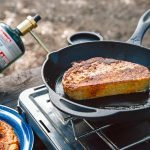 French toast is a great camping breakfast, but there’s a surprising number of ways for it go wrong. 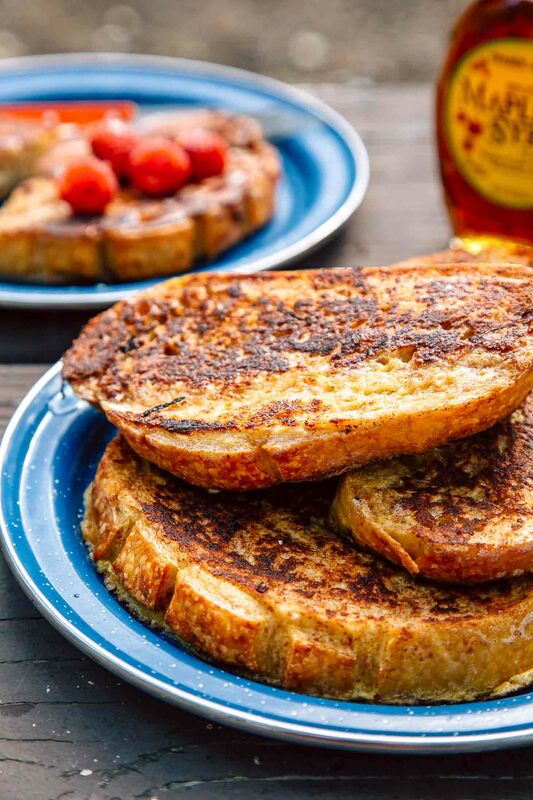 Too many times, we’ve made French toast that turned out too mushy, too eggy, or too rubbery. For Pete’s sake, it’s French toast! How hard can it be!? So we took some time to break down the basics and figure out where we could perfect our technique. We discovered there were a couple of critical steps we had been just sort of winging this whole time. After a couple of tests, we’ve outlined what we’ve learned so you can make killer French toast right out of the gates. 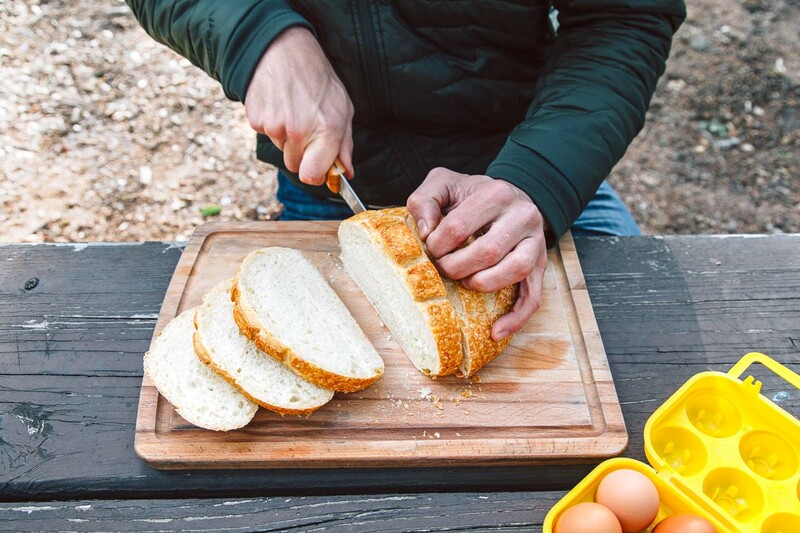 The single best way to achieve exceptional French toast at a campsite (or anywhere for that matter) is to use whole loaf bread and slice it yourself. Pre-sliced sandwich bread is just too thin, cook through too quickly, and often results in rubbery French toast. We recommend picking up a loaf of your favorite bread and cutting it into generous 3/4″-1” thick slices. You will be able to soak up more of the egg-milk mixture, giving you more time to crisp the outsides without overcooking the insides. If you like your French toast to have a rich, custard-like center, then use a fresh loaf of bread. If you prefer firmer centers, then a day or two old loaves of bread will be best. Previously, we’ve played fast and loose with this ratio. It really depended on how many eggs we had on hand. Sometimes one, sometimes four. This gave us wildly inconsistent results. But after a few kitchen tests, we’ve concluded that 3 eggs to 1 cup of milk is the ideal ratio. Anything less and the mixture is too thin. Anything more and you’re making a Croque Monsieur. For fresh bread, we found that a 10-second dip on both sides soaked up just the right amount of egg mixture. You want it to be moist throughout, but not totally saturated. For stale bread, soak the bread slices for up to 20-30 seconds. Adding vanilla extract, cinnamon, and even a little nutmeg are all good ideas for French Toast, but one critical step we had been leaving out was to add sugar to the mixture. Not only does the egg-milk-sugar mixture soak into the bread and sweeten it from within, but it produces a crispy caramelized layer on the outside. In fact, if you sprinkle a little extra sugar on the outside of your bread after you dip it into the mixture, you can get a spectacular golden brown finish on your toast. 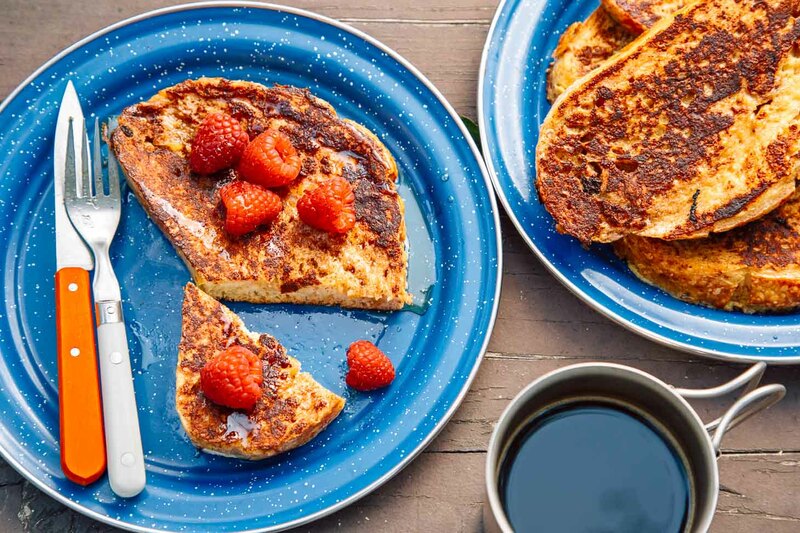 Using a well seasoned cast iron or nonstick pan, you’ll want to cook your French toast over medium heat. Most camp stoves have relatively small burners and we found we were getting a hot spot right in the middle. This resulted in unevenly cooked bread, particularly if we were trying to cook two slices at once. The solution: more butter. By cooking with more butter in the pan, the heat is more evenly distributed across the surface of the pan. We start with 4 tablespoons of butter and warm it up until just starting to froth. It might seem like a lot at first, but after toasting about eight slices of bread you may want to replenish. 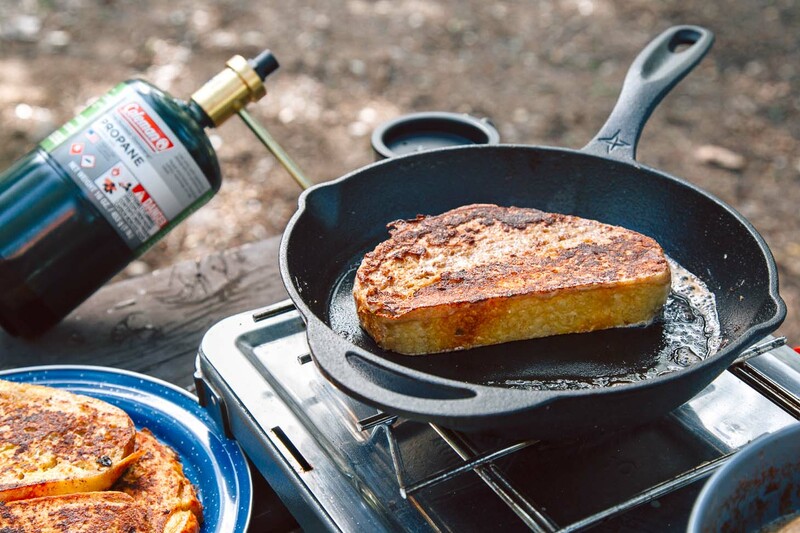 French toast can be a quick and easy camping breakfast. Just follow these basic tips above and the master recipe below and you’ll be on your way to French Toast heaven. Cut the bread into 3/4" - 1” thick slices. 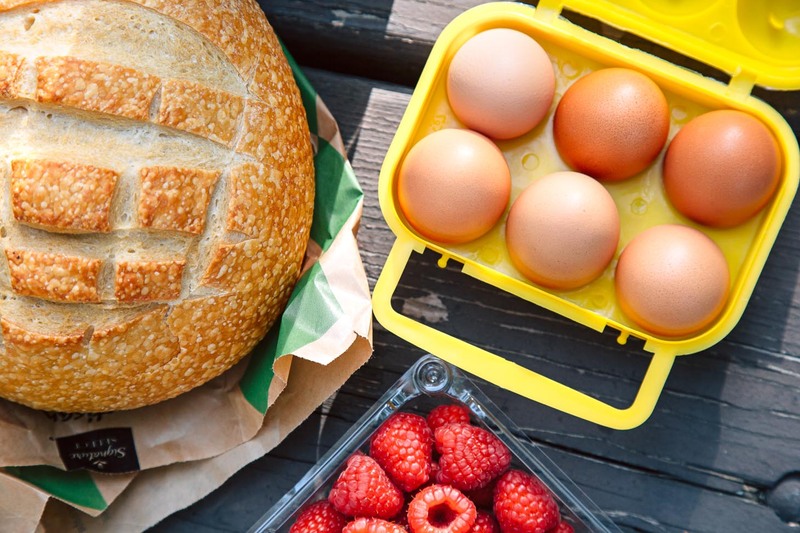 Beat the eggs first in a bowl large enough to accommodate a slice of the bread. Then add milk, cinnamon, nutmeg, vanilla, and sugar together, until thoroughly mixed. Heat 4 tablespoon butter in a skillet over medium heat. Dip a slice of bread in the egg and milk mixture and let it soak for about 10 seconds on each side. Let the excess drip off, sprinkle each side with additional sugar, and then fry it in the skillet until golden and crispy on each side, about 3 minutes per side. Repeat with the rest of the bread, adding more butter to the skillet as needed. Serve with maple syrup, fresh fruit, and a cup of hot coffee. Enjoy! 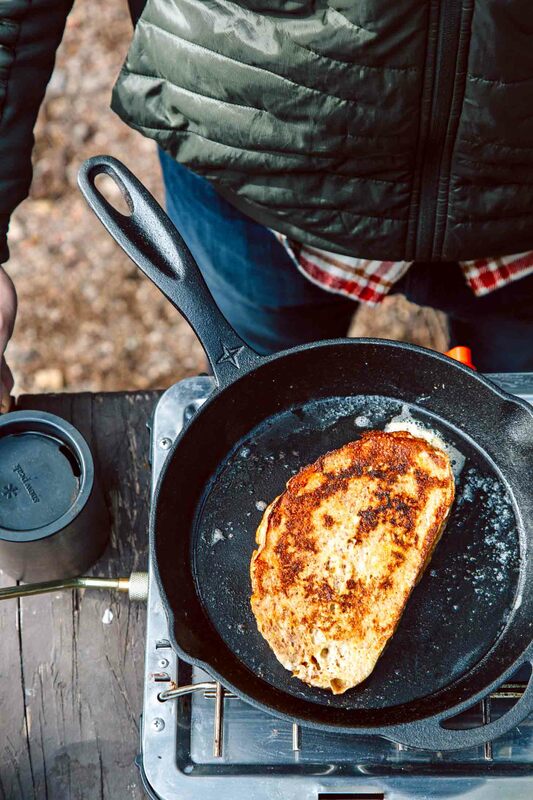 If you make it as a casserole in a Dutch oven, everyone gets hot French toast at the same time. Cooking two pieces at a time with no way to keep cooked pieces hot is not a recipe for success, though campers will be happy with even cold French toast. But no reason to do that. Dutch oven is far less work. No standing and flipping, etc. The whole purpose of camping is to be together. So why do so many recipes on this website create meals that are only hot for one or two people, and the cook has to cook and cook and cook one or two people’s breakfasts, and then the next and then the next. That’s not camping. Adapt these recipes for Dutch oven cooking so everyone can eat TOGETHER and so the cook isn’t relegated to short-order cook duty. Sorry for the rant. I like the recipes but many make no sense if the group is larger than 2. Thanks for your suggestions. The majority of our readers camp with a friend or partner (per our reader survey), which is why most of our recipes are scaled for two. Also, there are only two of us. But it sounds like you’ve come up with a good solution for your group size. Those appear to be modern camping plates, not nice plates. 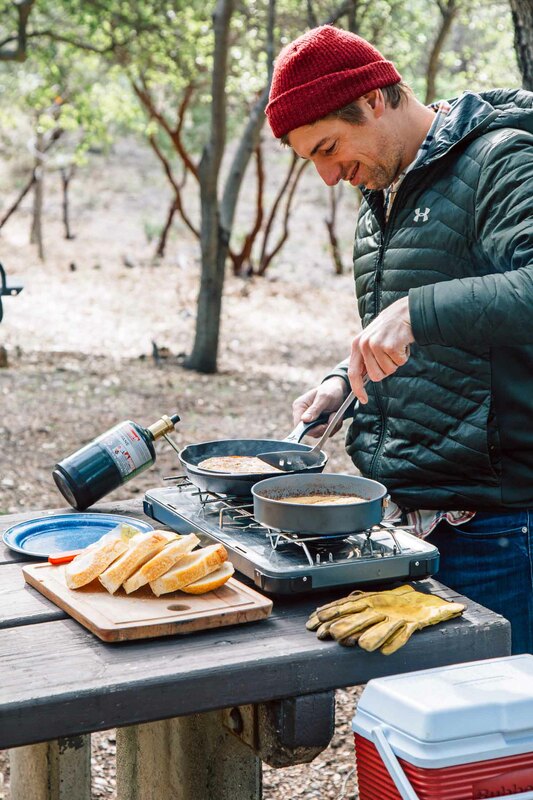 Also, cutting boards are very common with camping these days. This recipe seems very helpful. I’m going to have to give it a test run, and might use it for a large group event. Thanks for working out the details. Oh my gosh, this looks delicious! I can almost taste it. Thanks for the recipe!